Volatile markets can create headwinds for all types of investors. However, Franklin Equity Group’s Alan Muschott makes a case for convertible securities, a hybrid asset class that he thinks can adapt to various market conditions. He also gives his take on some misconceptions about this unique investment that investors might want to consider. Since the US stock market selloff in the fourth quarter of 2018, many investors have asked us how convertible securities performed during the upheaval. Issued by companies looking to raise capital, these hybrid investments are generally structured as some form of debt or preferred shares with an embedded option that allows conversion into common shares under predetermined conditions. According to our analysis, convertible securities generally outperformed their underlying stocks during the fourth quarter when the US equity market saw its steepest declines. That’s no surprise to us considering that convertibles have tended to perform well during periods of above-average market volatility. During periods where the overall stock market is declining, the fixed income component in convertible securities tends to provide some protection against erosion of value. Conversely, when a company’s common stock rises, the convertible security should participate in the rise in value because of the conversion option. However, as long-term investors, our overall view on convertible securities doesn’t change from quarter to quarter or during periods of market volatility. The average life of a convertible security is about five years before it converts, and we often will hold a convertible to maturity, regardless of market gyrations in the interim. In our view, convertibles can be attractive during various types of market environments, including rising markets, due to the potential asymmetric price relationship with the underlying common stock. Often called “balanced” convertibles, those with deltas (a measure of their equity sensitivity) near the middle of the range from 0.0 to 1.0 can participate more with an issuer’s equity upside than they do with the downside. These are the types of convertibles we prefer, as we feel this is the most appealing aspect of the asset class. We believe this ability to adapt to myriad market conditions can make convertibles an attractive vehicle for increasing a portfolio’s level of diversification. However, we’ve seen a few misconceptions about this hybrid investment class that investors might want to consider. In some parts of the world, it seems many investors view global convertible securities as a fixed income investment. However, we think this classification is far from complete. As we mentioned in this prior article, convertible securities are a unique asset class in the investment world that can offer investors both the growth potential of common stocks and the income potential of bonds. Because of these unique characteristics, convertibles may be classified as fixed income securities, equity securities or as a separate asset class. When we analyse global convertible securities, we take a different approach than many of our peers. We don’t base our holdings on a benchmark index, which tend to comprise an equal weighting between US, European and Asian markets. That may come as a surprise to certain investors in Europe or Asia who think we should have more exposure to their home countries. In our view, an equal weighting between those markets doesn’t reflect the actual market. 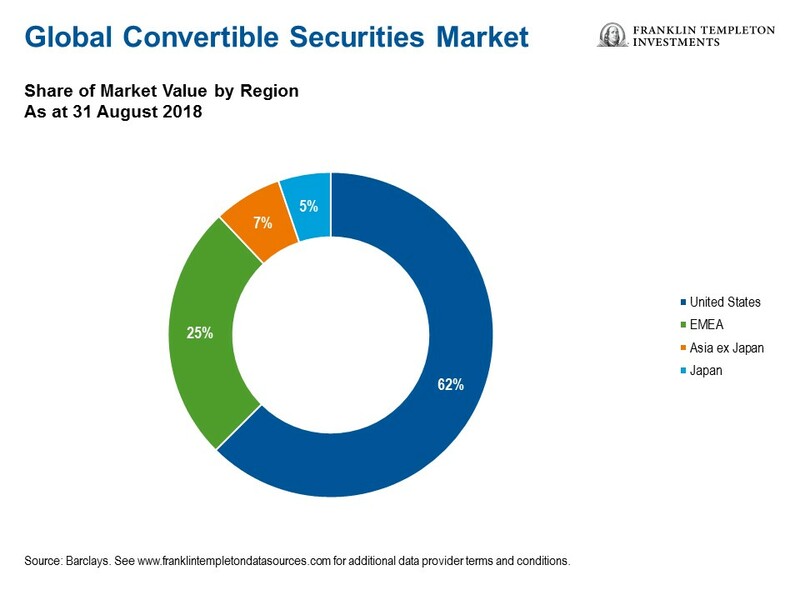 As the chart below shows, the United States accounts for about 60% of issuance in the global convertible securities market. We often source investments to the primary market, as newly issued securities exhibit the balanced characteristics we prefer. Therefore, we tend to have a larger exposure to US convertible securities than many of our peers. The global convertibles universe also tilts towards higher growth sectors like information technology, health care and consumer discretionary. Fortunately, these are all sectors where we see compelling growth drivers over the next several years. We see technology as increasingly becoming a non-discretionary expense for a wide range of companies and industries. In particular, we like certain convertible securities within growth themes, like on-demand software. Many companies often lack the expertise, personnel and resources to develop this technology in-house, which creates opportunities for firms in the cloud computing and software-as-a-service areas. Elsewhere we continue to see opportunities among companies showing high levels of innovation in the health care space. With accommodating regulators and novel new drug delivery methods and targets, we see a continuing wave of innovation in the health space. 1. Potential for Additional Diversification. Investors seeking yield from equity securities may find convertibles an appealing option, as they generally provide a more attractive income component than stocks alone (although generally lower than traditional bonds), while still allowing participation in the stock’s price movement. 2. Attractive Potential for Long-Term Risk-Adjusted Returns. Critics point out that convertibles do not increase as rapidly in value as stocks during rising markets; nor does their downside protection equal that of bonds during market declines. Nevertheless, historically they have delivered attractive long-term risk-adjusted returns compared with both stocks and bonds. 3. Robust and Diverse Opportunity Set. The flexible nature of convertibles makes them appealing to a broad range of investors. As a group, convertibles have historically presented an attractive risk/reward profile, but within the group there is considerable variation in the level of risk, sensitivity to movements in the underlying stock, and upside participation potential. Convertible securities are diversified across credit ratings, sectors, market capitalisation and investment characteristics. All investments involve risks, including possible loss of principal. The value of investments can go down as well as up, and investors may not get back the full amount invested. Generally, those offering potential for higher returns are accompanied by a higher degree of risk. Stock prices fluctuate, sometimes rapidly and dramatically, due to factors affecting individual companies, particular industries or sectors, or general market conditions. Investments in fast-growing industries like the technology sector (which historically has been volatile) could result in increased price fluctuation, especially over the short term. Bond prices generally move in the opposite direction of interest rates. Thus, as the prices of bonds in an investment portfolio adjust to a rise in interest rates, the value of a portfolio may decline. High yields reflect the higher credit risk associated with these lower-rated securities and, in some cases, the lower market prices for these instruments. Convertible securities are subject to the risks of stocks when the underlying stock price is high relative to the conversion price (because more of the security’s value resides in the conversion feature) and debt securities when the underlying stock price is low relative to the conversion price (because the conversion feature is less valuable). A convertible security is not as sensitive to interest rate changes as a similar non-convertible debt security, and generally has less potential for gain or loss than the underlying stock. Diversification does not guarantee profit nor protect against risk of loss.